1. Cancel the order from your supplier and get the refund. 2. Cancel the order in the Shopify admin and issue a refund to your customer. You can only cancel the order from the supplier if the order is not yet shipped out. If you have already paid for your order, the cancellation request needs to be approved by the supplier first. If an agreement is reached, the supplier will not ship your order and the transaction will be cancelled automatically. You will receive your refund between 3 - 15 business days. If no agreement is reached, the seller will continue to ship your order. 1. Go to the AliExpress.com website, "My Orders" page. 2. Find the needed order and click "Cancel Order" next to it. 3. From the pop-up window, confirm the cancellation request. 4. If an agreement is reached, the supplier will not ship the order and the transaction will be cancelled automatically. 5. 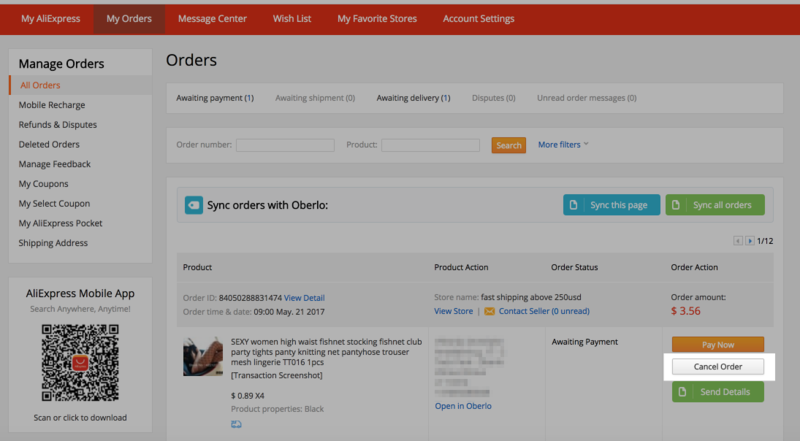 You will get an email notification about the order cancellation. 1. Go to Shopify admin, "Orders" page. 2. Select the needed order. 3. Click "More actions" and then "Cancel order". 4. From the opened modal, adjust the refund amount if needed and select a reason for canceling the order. Note: You can only cancel orders that have fulfillment status as ''Unfulfilled''. If the order is ''Fulfilled'' or ''Fulfillment requested'', you can only click on ''Refund items''. If you want to know more about cancelling orders in Shopify, check out the Shopify Help Center article.